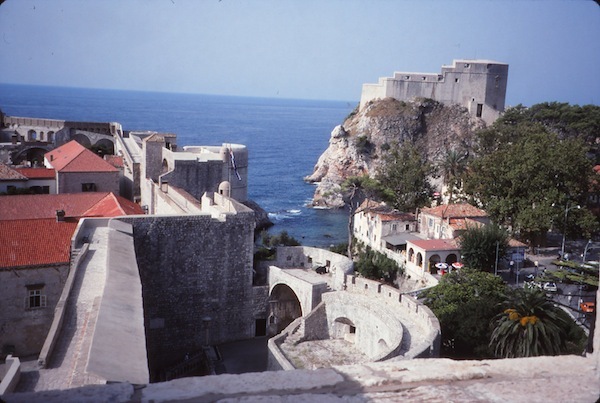 The walled Old Town of Dubrovnik, seen in 1993. This view looked the same in 2013, but the older sunny photos are better! 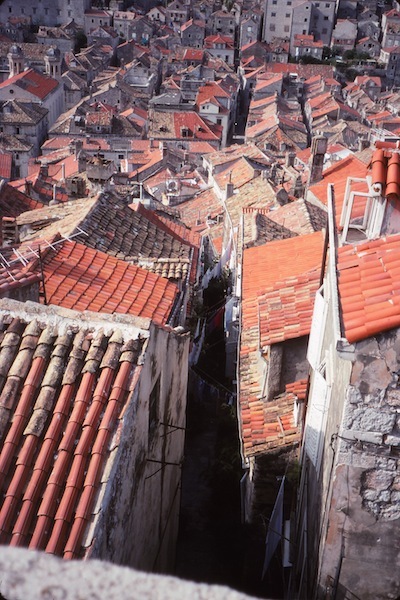 DUBROVNIK, Croatia — By tradition and by law, houses in Dubrovnik’s Old Town are built of stone. Initially, homeowners were inspired by a law that said wine could be stored only in the basements of stone houses. The goal was to reduce the chances wine would be lost in house fires. Judging by the look of old Dubrovnik, homeowners very much wanted to store wine in their basements. 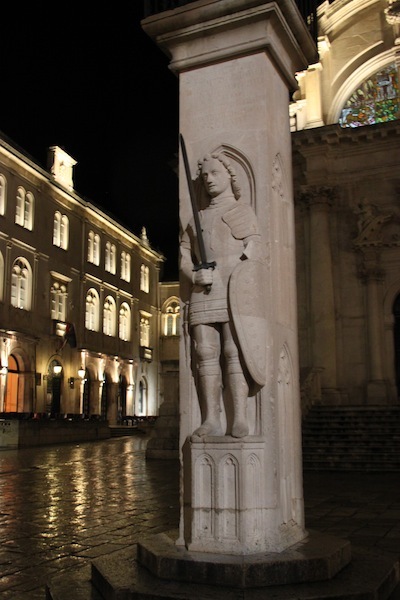 I returned to Dubrovnik, on Croatia’s coast, to see a beautiful walled medieval city that, when I last visited in 1993, was in recovery after suffering a siege and intermittently severe bombardment over a period of nine months in 1991-1992. View of Dubrovnik’s fortifications seen from atop the walls in 1993. Another part of old defenses, the Lovrijenac Tower, is visible at upper right. These features are every bit as dramatic today. This was part of what Croatians call the Homeland War, meaning the fight for independence from the former Yugoslavia. 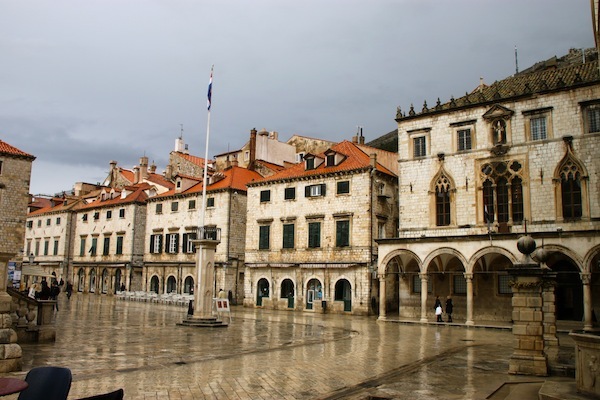 The walled Old Town, home to only 2,000 of the city’s 50,000 residents, was already a UNESCO World Heritage Site when the Yugoslav Army bombarded the city. Fires gutted some Old Town buildings but those wonderful stone exteriors generally stood. When I visited in 1993, many architectural features were still protected from shrapnel with wooden frames and sandbags (see accompanying photos). 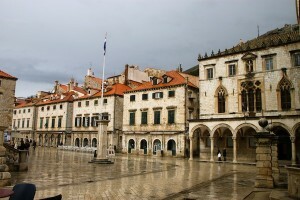 The Placa, with seating for the Dubrovnik Summer Festival visible in the foreground. In this 1993 photo, Orlando’s Column is protected by a decorated wood frame and sandbags. From the tourist’s standpoint, more than 20 years and countless repairs later, the Old Town has recovered its patina of agelessness, and the battered look is gone. 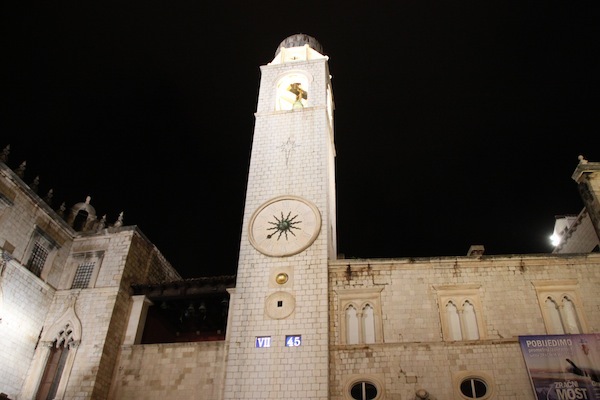 But a guided sightseeing tour takes recent history into account, based on my experience traveling in 2013 with a group of travel agents on an educational tour of Croatia. 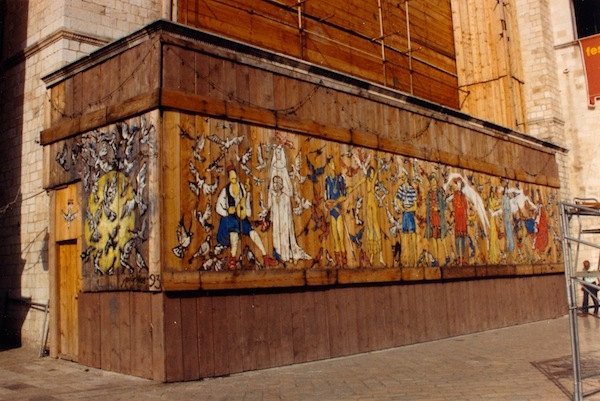 The front of the 16th century Sponza Palace, seen in 1993 hidden by a decorated wood frame and sandbags. guide pointed out was a wall map showing where the city had been damaged during the shelling. 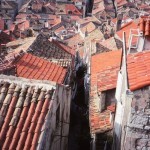 Rooftops in Dubrovnik’s Old Town seen from the city walls in 1993. Differences between old and new tiles are still apparent. In addition, mismatched tiles revealed where roofs had been repaired; the replacement tiles are still much brighter than older tiles 20 years on. The city’s two defining features are its colossally thick medieval walls and the broad main street that goes by two names, the Placa and the Stradun. The walls, intact after centuries, extend for a little more than a mile and range in width from about five to 10 feet along the portions that overlook the Adriatic Sea but are as much as 20 feet thick on the landward side. Forts and square towers that still punctuate the walls enhanced the walls’ defenses. 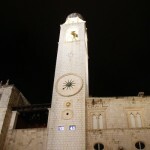 Clock Tower, which rises above Dubrovnik’s city walls at one end of the Placa. Tourists can walk on top of the walls. 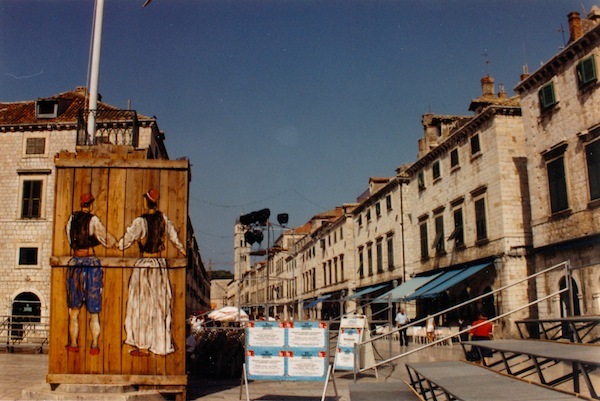 The travel agent group did not have time for that, but in 1993, I walked on the walls for absolutely stunning views of the rooftops (and at the time, missing roofs), as well as church domes and steeples, the city’s Clock Tower, the walls and the Adriatic. 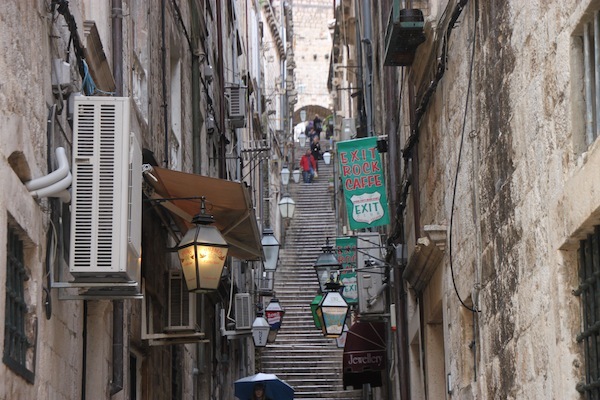 Street in Dubrovnik’s Old Town that is essentially a stairway. settlements, the larger one on a tiny island and the other climbing up the hillside on the mainland. 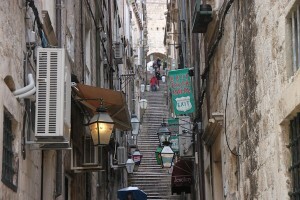 In fact, some streets on the original mainland side are essentially modified stairways. The landscape inclines somewhat on the island side, too. 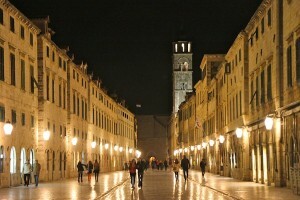 The Placa in Dubrovnik’s Old Town. The Sponza Palace is at far right, and the back of Orlando’s Column is below the flagpole. 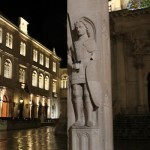 Orlando’s Column, which is a statue of a legendary knight carved into a column at one end of the Placa in Dubrovnik’s Old Town. handsome, dignified structures but with little ornamentation. Our guide noted that limestone, an important component in Dubrovnik’s construction, is porous and hence also valuable for its ability to clean water. This is one reason, she said, the city can still use a sewage system and an aqueduct dating from the 15th century. 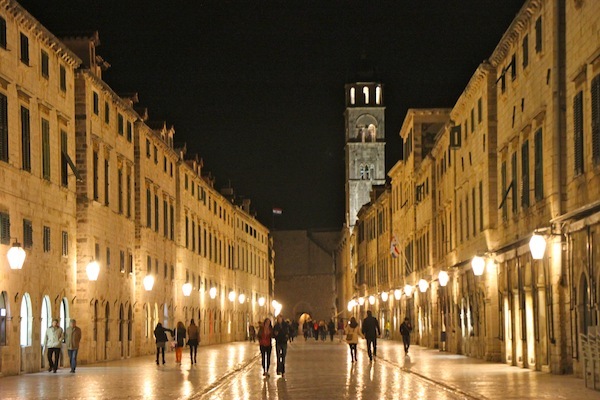 Nighttime view of the Placa in Dubrovnik’s Old Town. The Great Onofrio Fountain, also built in the 15th century with its huge dome and 16 water taps, is the end point for the aqueduct. 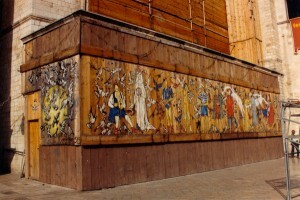 It is at one end of the Placa. The Sponza Palace, as well as the city’s Clock Tower and St. Blaise Church (named for Dubrovnik’s patron saint) are at the other end of the Placa.